US - Today’s news is dominated by trade, some good and some bad. First, the bad, writes Steve Meyer in the National Hog Farmer. The World Trade Organization announced today that Canada and Mexico can impose retaliatory tariffs on U.S. goods and services valued at a total of $1.01 billion per year. Canada is authorized to impose $787 million while Mexico will be allowed to impose $227 million in tariffs. One news report says the tariffs could be in place as early as next week. The decision is not appealable. It looks like a record of 0-4 with the WTO makes you the loser. If the United States were a ball team with that record, the coach would likely be fired. So what will it be, Sen. Stabenow? That is the question being asked in Washington as Deb Stabenow (D-MI), the ranking member of the Senate Agriculture Committee, who has led a small group that has caused the entire Senate to drag its feet on action to prevent tariffs in hope of salvaging a meaningless “voluntary COOL” program out of this 13-year fiasco. At this point, it doesn’t matter what anyone in Washington, DC, thinks will rectify the situation. That power is held solely by government officials in Ottawa and Mexico City. If they aren’t satisfied by U.S. lawmakers’ actions, they will move to impose tariffs and they have made it clear for a long time that they will accept nothing less than repeal. The House of Representatives took care of this long ago. It is time for the Senate to act to prevent these tariffs that will damage many U.S. industries beyond pork and beef. Just how much damage will fall on U.S. pork producers is yet unknown since the amount of tariff on each individual item is yet to be announced by either aggrieved country. There is a slim chance that pork and beef will be spared from Canadian tariffs since anything that drives down U.S. prices will also drive down Canadian prices. It appears, though, that Canadian producers are willing to shoot off a few toes in their effort to get rid of MCOOL. I have to admire their principle, but wonder just how much principle they can afford right now with the sharp decline of both hog and cattle markets over the past two months. I hold out no such hope of a reprieve from Mexico, whose government is under more or less constant pressure from pork producer groups to do anything that might stem the flow of U.S. pork southward. Though Mexico has never released a list of potential tariff targets, I will be shocked if pork is not on it. While that part of trade news is bad, data for October exports was good! October saw 410.2 million pounds, carcass weight, of U.S. pork exported. That figure is 6.9% larger than one year ago and brings the year-to-date total to 4.082 billion pounds, just 0.45% lower than at the end of October 2014. These figures are much as we had expected for the month and for the rest of this year with annual 2015 exports still likely to exceed those of 2014 by 2 to 4%. To underscore the importance of MCOOL tariffs by Mexico, note in Figure 2 that Mexico was the only market to take more than 100 million pounds of U.S. pork in October, that October’s 129.8 million pounds of shipments to Mexico was more than 10% larger than one year ago and that Mexico has taken 1.27 billion pounds of U.S. pork so far this year, 11.5% more than last year. That total is 25% more pork than the United States has shipped to second place Japan this year. Was there some “tariff-beating” going on in October shipments to Mexico? Perhaps. But monthly year-on-year gains have been as high as 26% so far in 2015 and six previous months saw year-on-year growth that exceeded October’s 10.5%. I suspect that any “beat-the-tariff” surge would have happened in November anyway as the WTO announced several weeks ago that its decision would be handed down this week. Several other markets saw year-on-year growth in October as well. China-Hong Kong was up 21.8% - albeit from very low levels one year ago. Ditto for shipments to Taiwan (+378%). Exports to the Caribbean grew by 39% versus one year ago while other markets took 14.6% more U.S pork in October. October exports to Korea were smaller than one year ago (by 5.9%) for the first month in 2015 but year-to-date shipments to Korea remain 34.2% larger than last year. Through October, Mexico ranks first among individual U.S. pork customer countries while Japan is second, Canada is third and Korea is fourth. 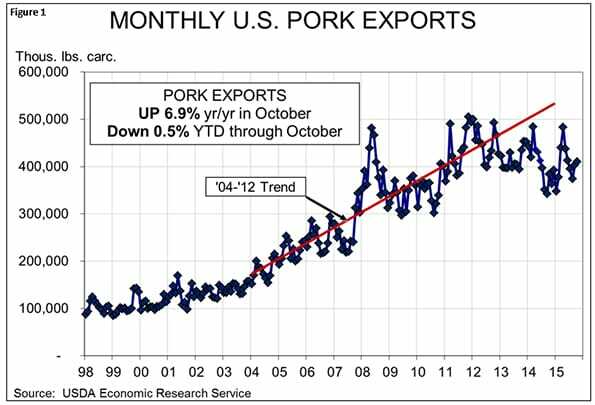 The value of U.S. pork exports in October was $385.4 million, 17.2% lower than last year. That figure brought year-to-date pork muscle cut export value to $3.980 billion, 16.3% lower than for the same period in 2014. Both of those figures reflect, primarily, this year’s lower wholesale pork values. Pork variety meat exports continue to fall far short of their 2014 levels. October’s variety meat shipments amounted to only 31.882 million pounds, 33% lower than one year ago, and brought year-to-date variety meat exports to 323.8 million pounds, 18.6% lower than one year ago. The value of those October shipments ($48.471 million) was down 43.5% from last year. Year-to-date pork variety meat value of $526.65 million is 26% lower than one year ago. To once again underscore the importance of the current COOL situation: Mexico is our second largest pork variety meat customer. Just over 34% of our total variety meat exports this year have gone to our southern neighbors. 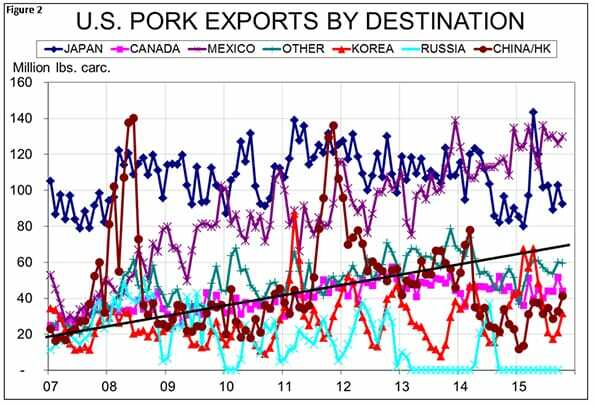 China-Hong Kong is the largest destination for U.S. pork variety meats, taking 41.8% of our total so far in 2015.